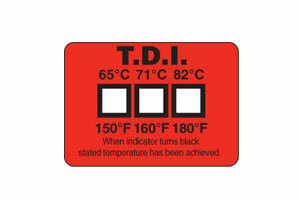 Triple Level Thermal Disinfection Indicator (TDI) is designed to withstand the extreme conditions within an industrial dishwasher and provide permanent proof that a rated temperature has been reached. Not one, but 3 distinct temperature levels depending upon need. An irreversible colour change occurs from white/grey to black; at 65°C (150°F) for standard dish washers, at 71°C (160°F) for a thermal/chemical disinfection and 82°C (180°F) when a thermal disinfection temperature has been reached.